When are the next IBPS bank exams in 2019 is one common question that arises regularly among those preparing for public sector bank exams in India.To solve this, IBPS Calendar 2019 - 2020 is released at the start of every year by the institute.The official PDF notification for the current year is finally out, thereby enabling you to plan for jobs in any of the 20 public sector banks across India. Although there are many government exams, aspirants are very interested to know about upcoming bank exams for the year as banking sector provides huge opportunities for graduates. Therefore, if you are dreaming about bank jobs & aspire to become a Probationary Officer (PO), Clerk or Specialist Officer in any PSB, then you must first qualify in IBPS bank exams. When are the next IBPS bank exams going to happen? Inorder to stop unnecessary rumors & keep candidates informed - IBPS started publishing their exam calendar/ timetable from last year. The official notifications for the above examinations will be released approximately 45 days before the mentioned dates. IBPS RRB exams 2019: These examinations are for office assistant and officer posts in Regional rural banks (RRB). IBPS PO exam 2019: These exams are for probationary officer positions in public sector banks. IBPS clerk exam 2019: For clerical jobs in banks, these exams are to be taken. For example, the IBPS PO-IX exam online registrations could open during the month of August 2019. I heard that IBPS will stop conducting bank exams hereafter.Is it true? It is true that public sector banks are under severe stress due to rising NPAs. It was due to this reason, IOB did not recruit last year as RBI imposed PCA action on them to clean their accounts. But other banks will continue to recruit freshers for entry level jobs.For that to happen, IBPS bank exams needs to happen as planned. Because of mounting losses, the number of vacancies only may get reduced. It’s Exam Time from August!! Looking at the table, you need to allot the later half of the year 2019 completely for bank exams. The common written examination for Officers (scale I,II & III) & Office Assistants in Regional Rural Banks (CWE RRB-VIII) is scheduled in August 2018. 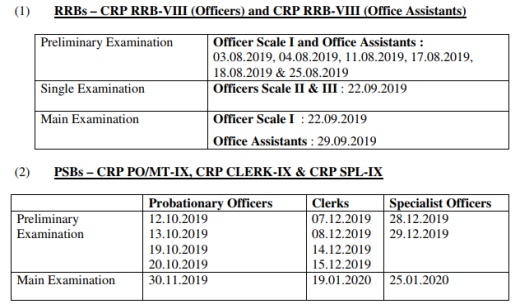 Similarly, you will have to appear for IBPS PO (CWE PO/ MT-IX) & IBPS Clerk (CWE CLERK-IX) during October, November & December 2019 respectively. They will be followed with the IBPS SO (Specialist-IX) prelims in December & Mains in January 2020. IBPS normally the releases the vacancy list for PO, Clerk & Specialist officers only after publication of exam results. With the IBPS calendar 2019 now out, now it is time for you to check if you are eligible for bank exams in 2019.Also you may now start planning and preparing with the necessary bank exam books and guides.